Nothing Says Americana Like Jukeboxes! 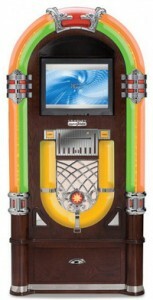 If you have a game room, then a “must have” is one of our Jukeboxes. Lucky for you, we offer not only a complete selection, but we are also a Rock-Ola distributor and carry their complete line of CD Jukes. As a “Gold Seal” distributor for all Crosley products, check out their newest digital jukeboxes which provide nostalgia on the outside coupled with the latest modern technologies on the inside! 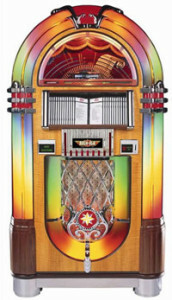 With such a vast array of selections, BarsandBooths can guarantee a jukebox for any budget! Don’t forget to ask for our 80-CD package of the best retro hits from the 50’s, 60’s, 70’s and 80’s. This package is a deal maker! Click on any photos below for additional information. For a “close up” look, click any of the Jukeboxes below. If you have any questions or wish to place your order, call 304-728-0547, OR send us an email.